” But God has so composed the body, giving greater honor to the part that lacked it, 25 that there may be no division in the body, but that the members may have the same care for one another. 26 If one member suffers, all suffer together; if one member is honored, all rejoice together. 27 Now you are the body of Christ and individually members of it,” 1 Corinthians 12. Help us to remember this throughout this month and to fervently intercede for our brothers and sisters who are suffering. Help us to not grow weary in praying for them, to not get so comfortable with our lives that we neglect to pray for those who do not share the same privileges. Lord, we so often use the excuse of busyness – make us stop. Help us set time apart, to dedicate time to pray for believers in the MENA district. 1 The Lord is my shepherd; I shall not want. Lord help us to be content, to have thankful hearts and to focus our eyes and minds not on earthly possessions but on our Spiritual gifts. 2 He makes me lie down in green pastures. He leads me beside still waters. Thank you for Your green pastures, Your still waters where we can find rest. Where we can slow down and intercede, where we can sit at Your feet and be fed, where we can be filled so we can fill others who need You. 3 He restores my soul. You restore our hearts, our minds, our souls. Your greatest gift is a peace that surpasses our understanding. Lead us into that peace, restore what the world and our busyness steals from us. 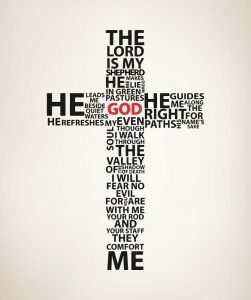 He leads me in paths of righteousness for his name’s sake. Lord, we are made righteous by Your Son. Lead us on roads of righteousness, help us walk the small and narrow road. 4 Even though I walk through the valley of the shadow of death, I will fear no evil, for you are with me; your rod and your staff, they comfort me. We plead for our fellow-believers, that You would be their shield and armor – that while they walk through the valleys, You will lead and You will guide. That Your Spirit will be ever-present, that under Your wings they will find rest and safety. That Your Words will negate their fears and give hope. 5 You prepare a table before me in the presence of my enemies; May they experience Your provision, grace and mercy even amidst their enemies, may they taste and see Your goodness! You anoint my head with oil; my cup overflows. Lord, anoint our heads, cover our minds, renew our thoughts. May we have transformed ways of looking at situations and circumstances, may we have the mind of Christ in all things and may we overflow with Your Spirit. May we drip on all we meet and be a fragrance that brings life. 6 Surely goodness and mercy shall follow me all the days of my life, and I shall dwell in the house of the Lord forever. Thank you that Your goodness and Your mercy pursuit us. Thank you that You pour Your blessings on us, and that we can dwell in Your presence every second of every day of our life. Thank you for the monthly testimonies we can read that share Your miracles and Your grace. May that encourage us to never stop. May that give us hope.